Take total control on the water with the new Minn Kota® Riptide Powerdrive 55-lb. 48" i-Pilot Trolling Motor. Equipped with the latest version of the revolutionary i-Pilot control system, the Riptide Powerdrive with i-Pilot is the easiest, most intuitive, most advanced saltwater trolling motor on the water. Control every function from the palm of your hand. Deploy the Auto Pilot feature and let the motor keep you on course automatically. Use iTracks to memorize and return to your most productive trolling patterns. And use Spot Lock GPS anchoring technology to keep you on your hot spot, even in windy conditions. Variable speed control allows for precise speed, while Digital Maximizer technology provides the perfect amount of power to help your battery's charge last up to 5x longer. 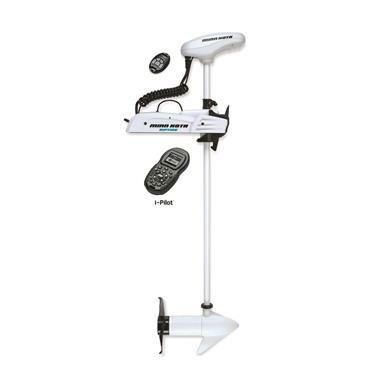 Minn Kota Riptide Powerdrive 55-lb. 48 i-Pilot Trolling Motor is rated 4.0 out of 5 by 1.